Parents, put aside your fears of stepping on a Lego and think back to when Legos were the coolest toy you could have. Do you remember? Legos are classics. Now, Lego Technic sets allow your child (or you!) to build bigger, more realistic vehicles. You can build anything from an offroad racer to a mining excavator to an enormous, four foot, working crane. The possibilities are endless. Lego makes this possible by using interconnecting rods and plastic pieces that mimic the real thing. No more boxy bricks. Real engineers design the look, and motors bring the finished vehicle to life. Kids get hands-on experience with engineering and mechanical thinking. No matter what your child loves, there’s a Technic vehicle that satisfies his or her dreams. We’ve put together a list of the best Lego Technic sets to help you get started. Let’s take a look. 17. 42072: WHACK! / 42073: BASH! This model crane reaches 39 inches high when fully extended. It’s a dramatic build and one of the tallest to date. You have complete control over stabilizer legs, rotating the structure 360 degrees, operating the winch, and extending the boom. There are plenty of manual functions including four-wheel drive, moving pistons inside a detailed V8, and adjustable mirrors. There’s plenty of detail in the cab and in the accessories (tools, chains, and a fire extinguisher). There are Lego Technic plates included for building and lifting. The red and black color scheme is striking, as is the multicolored pieces that go into building the engine and internal components. The B-model is a pile driver, and one of our biggest complaints on the tail of an impressive A-model build. It’s pretty much the same body as the crane but reconfigured. It’s cool looking, we’ll give it that, but a bit disappointing for a B-model. With an impressive size – over two feet long and sixteen inches tall – the Bucket Wheel Excavator is one of the largest Technic Lego set to-date. It has nearly 4,000 pieces and will both challenge and delight even the more experienced Technic set builders. The set includes a 2:1 design that can show off its multiple powered functions or convert it into a Mobile Aggregate Processing Plant, which is a rare “B-sided” design that is as good as the first. Like the other, it can drive backward or forwards, no steering. The truck stays the same in both models. For those who don’t know, a Mobile Aggregate Processing Plant follows the Excavator around the mine. It pre-processes the ore via a boom, which for the model is eight inches long. You might notice that the movements on the machine are very slow and jerky compared to other vehicles with the strongest Power Functions XL motor. This is partially due to its size, but also because it’s based on the full-sized models, which have a top speed of 0.37 mph. This impressive looking Mercedes-Benz Arocs construction truck almost looks ready to go out on the job site and get work done. It has the rugged construction and careful attention to detail that attract the attention of both kids and adults. With a large motor and an advanced pneumatic system, you can operate the crane arm mechanism, grabber arm, extend the outriggers, and raise or lower the tipper body just like you are at a construction site. It also maneuvers easily with its twin axle steering, double differential drive, and independent suspension. Its coloring matches the classic white, gray and black scheme of the real-life Mercedes-Benz Arocs. It is one of the larger Lego Technic sets, and builders should plan accordingly. It often ranks as one of the more challenging builds, but the finished product speaks for itself. This wheel loader from the Volvo/Lego partnership is a fun replica of Volvo’s famous construction vehicle. It has a detailed six-piston motor, articulated steering, and a working lift arm. The remote controls both driving and digging functions. Multiple gears allow you to control both functions without having to toggle between them. It has a massive bucket that can hold a big load. The classic Lego yellow doesn’t look so toy-ish here because of the traditional color of construction vehicles. The B-model is an articulated hauler. It’s one of the few alternative-builds with dedicated stickers, so you’ll have to swap out A-model stickers or invest in alternative pieces if you want to keep both intact. It’s a four-wheel A25F inspired vehicle. It uses a six-piston motor, and driving is one of the most enjoyable from Lego Technic because there’s little backlash. It powers through small obstacles easily. The only downside is that small, loose pieces fall through the bucket. B model stickers destroy the A model stickers if you replace them. The Crawler Crane is one of Technic’s most impressive builds. 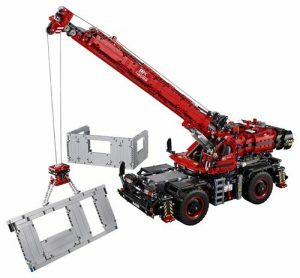 The crane is over two feet high and includes a remote control for operating the boom, raising and lowering the claw, and the driving feature. You can add secondary builds to extend the crane to over three feet if you want a bigger challenge. It uses an authentic pulley system. You should have plenty of cable to use when playing. The structure lifts, extends, and rotates just like a real construction crane. It’s a bit slow to deploy, but there are a lot of moving parts to get together. The B-model is a tower crane with no power functions, but it still features extendable cables for lowering and raising materials. The best part is once you build the base for the A-model crane, you don’t have to disassemble it for the B-model crane. It works for both models. The Mack Anthem is another authentic build. It has a six cylinder L-motor with a spinning radiator and working pistons. The trailer has extendable outriggers for stability. You control the rear wheel drive through front axle steering. The color scheme isn’t exactly true to life, but the blue is more realistic than some of Technic’s brighter color schemes. The trailer is detachable and features a manual loading mechanism. It comes with a trailer container to use for loading. Although the crane isn’t motorized, it’s an impressive build that teaches kids about mechanics and engineering. The secondary build is a very popular Mack dump truck. It’s one of the most complex B-models available and could almost be classified as an A-model. The garbage loading feature is manual as well, and the rear doors open so you can see everything that’s inside. It has a very detailed, inline engine, and rear differentials. The All Terrain Tow Truck is a heavy duty build with two motors, and a remote control that drives and controls the lift and outriggers. You can view the engine by lifting the front hood to see movement. The crane extends 20 inches. Remote functions include lifting and lowering, maneuvering the wench, and rotating the crane. The gearbox is one of Lego’s most elaborate so it can handle all those movements. It’s a bright blue color scheme and includes a teddy bear detail for the front bumper. The B-model is a research explorer vehicle. Toggle between two remote functions with a switch for driving and steering, and manipulating the body of the vehicle. This B-model includes a lot of leftover pieces, but it’s fun to drive. If the remaining pieces created some kind of research material, we’d be a lot happier. Overall, it’s a fun build. Bugatti and Lego team up for a genuinely unique Technic build, a replica of Bugatti’s iconic Chiron. It includes all the typical features, including the Chiron’s baby blue color scheme, the horseshoe grill with the logo, a single beam tail light, and low, curved profile. It features one of Lego’s most sophisticated Technic engines. It has 16 fully moveable cylinders with two crankshafts and a fully functioning gearbox with eight gears. The model is four-wheel drive, and Lego even recreated the Chiron’s seat style. Lego created a new wheel to mimic the Chiron’s low profile. The wheel has spoked rims with the logo. You can also switch the active rear wing from handling to a top speed function by inserting the top speed key. The only issue we see is that it doesn’t include a standard B-model although there are plenty of resources on the internet for augmenting the build. The Porsche contains one of Lego’s most complex and detailed car assembly packages. Even though the inner mechanics will not be visible once it is finished, you can still be taken aback by the detail and shine of its outer orange exterior. It even comes with its own collector’s book, detailing the history of LEGO Technic and Porsche GT cars. This car has a complete 1:8 scale model of every last detail you’d expect in a Porsche, from the detailed racing seats and dashboard to the flat 6 engine beneath the hood. Unlike other Lego Technic models, this one is meant for an older audience rather than children. The manual has 600 pages detailing its 900-step construction, which is actually a lot like building the car from scratch. Still, it will be well-worth the time spent on those 900 steps. The end result looks exactly like a miniaturized Porsche and will be a graceful addition to a car enthusiast’s collection. This 2:1 farming set can become a CLAAS XERION tractor or a CLAAS XERION 5000 TRAC VC with Silage Plow. It contains almost 2,000 pieces for a realistic-looking farming set that looks great on the shelf of any Technic or Farming Machinery collector. It comes in the standard green, gray and red color scheme of the CLAAS farming tractors and the cab seating is packed with details found on the real thing. The Power Function motor will raise the cab and turn it 180 degrees and work the versatile crane and outriggers. Manually, you can operate the full-sized wheels and crab steering. You can raise and lower the tree trunk, which is included in the set, using the working crane claw. This one is an authentic replica of a real-life Volvo crane. It’s a super cool yellow and black color scheme. It features a pneumatic, extendable boom and working bucket. You can control the cab, steering, and outriggers with manual controls, but a motor upgrade is available to make the boom fully motorized and give the model real working lights. With the boom extended, the vehicle is 11 inches high! The boom is a little difficult to operate unless the outriggers are extended (just like a real vehicle), but the outriggers don’t work well on anything but a smooth flat surface. The B-model is a compact material handler. It features the same pneumatic system with forward and reverse switches for manipulating the arm. The grips manually close with a twisting system. You can also open the front to reveal the engine. The loader is really light, so you’ll have to stabilize it with your hand when pumping the arm up or down. The 2:1 Ocean Explorer vessel can be rebuilt into the Push Boat and Barge. The overall impression is that it would be a fun toy to imagine sailing the seven seas, plus a buildable submarine and helicopter landing pad for flights and underwater exploration. Small screws on the roof turn the crane and there are operable moving parts on both the submarine and the helicopter. There is enough space in the cockpits for a small Lego figurine to stand in as the captain of the vessel. The main drawback is the helicopter landing pad. It is positioned at the front of the Ocean Explorer, instead of the back, and is a little too large for the overall design. Still, if your child (or you!) dream of sailing the oceans, or have a passion for marine exploration, this will be a good choice to buy or give as a gift. Even without changing designs it gives three builds in one set. Has a realistic, working design that you can play with or display. Helicopter pad is too large relative to the ship and normally they would be on the back, not the front as pictured. This helicopter can be made with a single Heavy Lift rotor or transformed into a tandem rotor helicopter. The winch and buildable cargo are especially fun to play with when hooked up to the motor for maximum functionality. Among its best features would be its motorized functions, including a working winch and the contra-rotating rotors. The motor also allows it to light up and open the cargo bay doors. However, while the motor can make the rotors spin, it does not get enough speed to actually take flight, which makes it a safe choice for parents of children who love flying toys. The end result is a large, serious-looking helicopter that can make for a great toy or an impressive prop on display. We especially recommend it to anyone who enjoys the technic flight sets and can love it even though it cannot fly on its own. Moving parts and careful detail gives it a realistic toy that is always fun to play with. This motorized, remote-controlled LEGO racer can drive its way over obstacles at an average speed of about 1 mile per hour, on two large tracks powered by six wheels. The Tracked Racer comes in a 370-piece puzzle box that also includes the receiver, battery box, motor and remote control. It works best inside, where it can nimbly go backward, forwards, left, right, or spin 360 degrees. We recommend it because it carries all the fun of a motorized truck with the added fun of building it from scratch. The suggested ages are 9+, and many adults have fun with it too. The vehicle is rugged and has great climbing abilities. Works best indoors, but can go both indoors and outdoors. Can be assembled fairly quickly. Instruction manual not very clear on how to operate motors from the controller. What’s cooler than a motorcycle? This authentic BMW R-series is a cool blue and gray motorcycle with all-terrain wheels. It features real moving parts such as the steering column, moving pistons in the visible engine, suspension, and a kickstand. Designers partnered with BMW to create this scale model of an actual motorcycle. It comes with the stickers you need for a detailed dashboard and decorations. It also features a uniquely decorated 40th Anniversary Lego brick. Unfortunately, it doesn’t include a seat. However, it does fit a few figures pretty well without Lego having to create an entirely new piece. The alternative build is a futuristic flying bike complete with its own stand. It’s wildly different than many of Technic’s vehicles, so if you’re looking for something unique to display, this is the B-model for you. It includes a rotating and angling rear thruster and folding wings. It seems like the luggage pieces for A-model are there just to make the stand for the B-model, but we aren’t complaining. This luxury yacht replica features lines and winches, a detailed hull, and a real working rudder. Your child can control it through a lifelike wheel and tiller steering. It includes all the stickers you need and is a blue and white color scheme. For the monohull yacht build, your child can control sails by moving the winches. It’s not built for real water play, so there’s no motor function. As a model ship, it’s wonderfully detailed with the two working parts, the rudder, and the sails. Those features give kids a basic understanding of how sailing might work. The secondary build is a catamaran. Both builds use realistic detail modeled after racing ships with racing color schemes. It doesn’t have active steering set up, but with some ingenuity, you could help your child add that feature. Even though the ships aren’t built for actual water, they’re both simple enough that older elementary children can make them. It’s an entry-level model suitable for beginning builders. WHACK! is a high-speed racer with a bright red and green color scheme. It includes racing stickers, a sturdy front bumper to reduce impact, and a cool rear spoiler. The pullback motor activates forward motion simple enough for a younger child to use. While younger children may need help building it, the action is immediately satisfying. The pop-out engine, new for December 2017, is activated on impact. BASH! is a similar racing vehicle with huge, all-terrain tires and a pull-back motor. It also features a pop-out engine, but the look of the vehicle is more aggressive. It’s a red and black color scheme with stickers included. Where the WHACK! is a sleek, Formula 1 style racer, BASH! is a heavy duty dirt track style racer. The secondary build for both is to combine them into a six-wheel racer (instructions online). Lego Technic Sets are fundamentally different from classic Lego building sets, but they are based on the same idea; that it is a lot of fun to put things together. The main difference is that the Lego Technic sets really delve deeply into what makes the things around us work, whether it’s a helicopter in flight or a Porsche driving down the street. Each set comes with many different beams, axles, and other parts, just like the pieces that go into building an actual vehicle. The great thing about Legos and Lego Technic sets is that you can really let your imagination take hold. Even if some of the technic sets do not come with remote controlled options or functioning motors, there are ways to add them in. For example, the Mercedes-Benz Arocs 3245 does not come with its own motor. The engine with moving pistons is a close replica but does not actually move the vehicle. However, as Lego Customer Service points out, you can add in the LEGO Power Functions IR Receiver 8884 and the LEGO Power Functions IR Remote 8885 to turn it into an RC truck powered by remote control. Many fan sites will list detailed instructions from other fans who have done the same modifications and loved them. While many people have fond memories of Legos from their childhood, the Lego Technic Sets have also brought together another community, known as the AFOL crowd for Adult Fan of Lego. The same skills that go into making model airplanes, or putting parts into the vehicles at the factory can be used to craft these amazingly realistic models. That detail has made the Lego Technic Set a popular gift idea for young children. In a world where computer screens have made everything virtual, Lego Technic sets stand out because they encourage the much older skill of tinkering and building things from scratch. Some children as young as 6 or 7 become fascinated with the process, which can often lead them to become teenagers and adults working in the STEM fields. When purchasing Lego Technic sets for yourself or for someone else, you will want to consider a few options. What is the age of the person who will be putting it together? How much experience do they have with building things? How much patience will they have? What are their interests outside of building things? One of the amazing things about the Lego Technic sets is that they come in all different shapes and sizes. Children who are fascinated with construction sets can build their own construction vehicles, then play with them on an imaginary construction site. Likewise, adults who may have spent their working careers on a research vessel can spend weekends assembling models that closely resemble the ship where they work and gain a new appreciation for how it all comes together. By finding a Technic set that aligns with pre-existing goals, hobbies, and interests, the process of building them will become even more engaging. Some technic sets are more challenging than others. Even the most challenging sets can be built by a novice user, but others find that it is better to start with simpler models and gradually work up to more complex designs. There are also books which give a detailed run through of how to build Technic models. Being an engineer might help one to understand the different parts, but this will be a basic rundown. There are both studded and studless beams. Studded parts are like the legos we all grew up with, that have raised and indented edges to help them snap together. Starting around 2000, Lego began using studless beams, also known as lift arms, in most Technic sets. The lift arms are always one unit width high. This matters in building vertically because it standardizes the process, lets things line up more easily, and gives more flexibility in design. Most motors in the Technic sets are battery powered but some will use a transformer. These motors power the movable parts of the finished products including items like the lift arms, doors, and winches. This is a relatively new addition to the Technic Sets. Pneumatic lego pieces use compressed air to move the pieces. They are seen in a few of these sets, including the Mercedes Benz Aroc Truck. Gears have been part of the Technic Sets since the 1970s. They come in different sizes and since 2008 have been optimized for studless construction. Power functions are the cutting edge of the Technics, fueled by our love of RC vehicles. They use motors, two infrared receivers, a remote control and a battery box to make a Lego Technic set to come to life. Some, like the RC racer, are already set up for the technology and others can be converted using special steps. Lego is currently making more models which can be retrofitted with the Power Functions package. The “Lego Guy” has been a fixture of the Lego Universe for decades and has even starred in his own movies. So it only makes sense that there should also be Technic Figurines to drive, fly, and race in the models that we create. They are not made anymore but 27 versions were created between 1986 and 2001. These ten best Lego Technic Sets are just the tip of the Lego that are out there. Each stands out in their chosen category because they are fun to build, cool to look at, and have detailed mechanics and operations that exceed the rest. Whether you are new to the world of building Lego Technics or have been a fan for quite some time, they will all bring fun and exciting challenges to your home mechanic’s shop. Unlike regular Lego sets, they come with a lift arm, or studless, construction which makes it easier to go vertical and get creative. Even if your set does not come with a remote control function, more of them are being retrofitted by builders with the official Lego modifications. Nor should you take the recommended ages to heart. Some younger children love the intricate building process, and the love never dies. Many adults find themselves as enthralled as any kid on Christmas.